Gunnar Nilsson's was a career cruelly cut short, not on the track, as was the case with so many drivers, but by cancer at the age of 29. "His rare talent had taken him swiftly to the top as No. 2 to Mario Andretti," wrote the Times, "[and] he was perhaps the most naturally gifted of the new generation of grands prix drivers." He sat in a racing car for the first time in 1973, racing in Formula Super Vee. He was clearly good as he stepped up to Formula Two and promptly finished fourth at the Norsring. Strong form in the German Formula Three series in 1974 earned him a works March ride in the British series in 1975, with him winning the title. He tried the more powerful Formula Atlantic series later in the year and won five rounds of that, with Lotus quick to snap him up for its 1976 Formula One line-up. 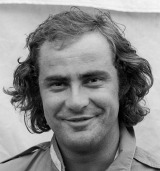 A pair of third-place finishes showed promise and he won the wet 1977 Belgian Grand Prix at Zolder, but then became increasingly inconsistent. No one knew it at the time, but Gunnar was suffering from cancer, and he was diagnosed at the end of the year. He still signed with Arrows as its No. 1 for the 1978 season but his condition deteriorated rapidly and he was forced to stand down before the first race. He dedicated his remaining months on running the Gunnar Nilsson Cancer Treatment Campaign, linked to Charing Cross Hospital, declining pain-killing drugs so he could work as long as possible. His death came five weeks after that of fellow Swede, rival and friend Ronnie Peterson.